The most prominent feature as you enter Broad Creek is the glass house on the right as you enter. It’s something to show to visitors, who often speculate on who cleans all those windows. It is also remarkable for the long stretches of undeveloped land on the north shore, due to large land holdings. 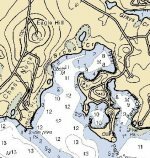 There is also a very long submerged spit that sticks out from Rock Point on the upriver side of the mouth of the creek; this spit is not as shallow as the one at the mouth of Blackhole Creek, but most boaters go around the marker to be safe. Once you enter the creek, beware of a rocky shoal just before you reach the island. Most Magothy bottoms are soft when you run aground, but this one is like pavement, apparently a slab of sedimentary rock. You can’t see it from the creek, but Eagle Hill is just north of the creek, the highest point around the river (157 feet above sea level). One of the best places to see Eagle Hill is from across the river on the south shore, in the mouth of Forked Creek. Park Creek is much smaller and shallower, located downriver from the entrance to broad creek. You should probably not try to enter it except on high tide or with a shallow draft boat. MRA has sampled one or two stations in this creek since 1992. The first, MR7, was near a channel marker before you reach the island. Another station, MR7A, was added close to the shore near the clump of Phragmites on the north shore in 1996. In 1997, the station was moved to a pier on the north shore of the creek, called MR7B. 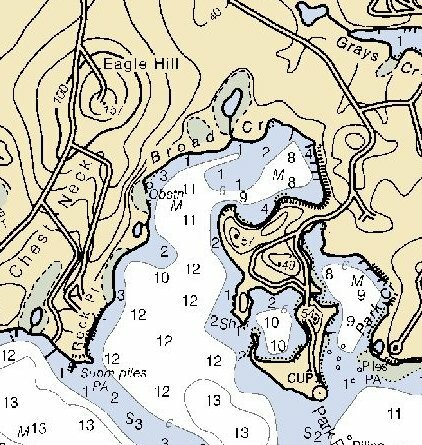 Water quality in Broad Creek is generally good, with some low bottom dissolved oxygen readings, although the water at the sampling sites is fairly deep (3 meters or more). Both creeks had fairly extensive SAV beds in aerial surveys done in 1978 and 1979. It is not known why the SAV has not returned to them, as it has started to return to Blackhole Creek, farther upriver, and Grays Creek, just downriver. The watershed appears to be quite small, with more wetlands than creeks.